نخعی کهن, مهدی, معینی, علی. (1397). تحلیل نیازمندی‌های سامانه پشتیبان تصمیم هوشمند با استفاده از مدل فرایند غیرخطی تکراری بهبودیافته برای کمک به ارزیابی عملکرد مؤسسات پژوهشی. دو فصلنامه علمی-پژوهشی مدیریت اطلاعات, 4(1), 121-155. مهدی نخعی کهن; علی معینی. "تحلیل نیازمندی‌های سامانه پشتیبان تصمیم هوشمند با استفاده از مدل فرایند غیرخطی تکراری بهبودیافته برای کمک به ارزیابی عملکرد مؤسسات پژوهشی". دو فصلنامه علمی-پژوهشی مدیریت اطلاعات, 4, 1, 1397, 121-155. نخعی کهن, مهدی, معینی, علی. (1397). 'تحلیل نیازمندی‌های سامانه پشتیبان تصمیم هوشمند با استفاده از مدل فرایند غیرخطی تکراری بهبودیافته برای کمک به ارزیابی عملکرد مؤسسات پژوهشی', دو فصلنامه علمی-پژوهشی مدیریت اطلاعات, 4(1), pp. 121-155. نخعی کهن, مهدی, معینی, علی. تحلیل نیازمندی‌های سامانه پشتیبان تصمیم هوشمند با استفاده از مدل فرایند غیرخطی تکراری بهبودیافته برای کمک به ارزیابی عملکرد مؤسسات پژوهشی. 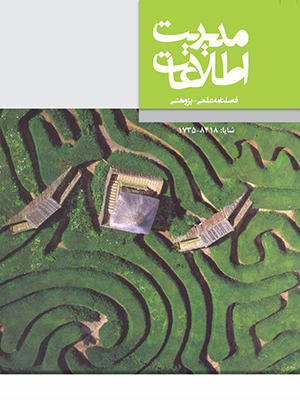 دو فصلنامه علمی-پژوهشی مدیریت اطلاعات, 1397; 4(1): 121-155. از آنجا که ارزیابی عملکرد یک مسئله نیمه ساخت‌یافته است؛ بنابراین یک سامانه پشتیبان تصمیم هوشمند می‌تواند با فراهم‌کردن دانش و مدل‌های مناسب ارزیابی، به تصمیم‌گیرندگان وزارت علوم، تحقیقات و فناوری (عتف) و همچنین مدیران مؤسسات پژوهشی در ارزیابی بهتر عملکرد کمک کند. داشتن یک فرآیند تحلیل نیازمندی‌ها در مراحل اولیه توسعه یک سامانه پشتیبان تصمیم، می‌تواند عملکرد بهتر این سامانه را تضمین کند. سامانه‌های‌ اطلاعاتی موجود کمک چندانی به تصمیم‌گیری مناسب در مورد ارزیابی و پیش‌بینی عملکرد مؤسسات پژوهشی زیرمجموعه وزارت عتف نمی‌کنند. مدل فرآیند غیرخطی تکراری مدلی مناسب برای تحلیل نیازمندی‌های یک سامانه اطلاعاتی است؛ اما ارزیابی ریسک در آن در نظر گرفته نشده است. در این پژوهش، برای تحلیل نیازمندی‌ها و ارزیابی ریسک‌های یک سامانه جدید، مدل فرآیند غیرخطی تکراری بهبودیافته پیشنهاد شده است. اعتبارسنجی و تصدیق این مدل فرآیند، با پیاده‌سازی آن توسط روش‌های اجماع گروهی نظیر دلفی و طوفان فکری برای تحلیل نیازمندی‌ها و ارزیابی ریسک‌های یک سامانه پشتیبان تصمیم هوشمند مناسب ارزیابی عملکرد انجام شده است. نتایج اندازه‌گیری میانگین و انحراف معیار دورهای مختلف تحلیل دلفی نشان می‌دهند که اجماع گروهی برای نیازمندی‌های مهم کارکردی و غیرکارکردی سامانه پشتیبان تصمیم هوشمند توسط ذینفعان مختلف حاصل شده است؛ همچنین ریسک‌های سامانه جدید نیز شناسایی شده‌اند. 2Prof., Department of Algorithms and Computation, School of Engineering Science, College of Engineering, University of Tehran | Visiting Lecturer, Iranian Research Institute for Information Science and Technology (IranDoc), Tehran, Iran. 3Prof., Department of Algorithms and Computation, School of Engineering Science, College of Engineering, University of Tehran | Visiting Lecturer, Iranian Research Institute for Information Science and Technology (IranDoc), Tehran, Iran. Performance evaluation is a semi-structured issue; therefore, an intelligent decision support system can help decision makers in the Ministry of Science, Research and Technology, as well as, managers of the research institutes to better evaluate the performance, by providing the required knowledge and appropriate evaluation models. Conducting a requirements analysis process in the early stages of the development of a decision support system can guarantee the better performance of this system. The existing information systems do not allow for a proper decision on the evaluation and prediction of the performance of the research institutes affiliated to the Ministry of Science, Research and Technology. Although the iterative non-linear process model is suitable for analyzing the requirements of an information system, it does not consider any risk assessment. In this research, an adjusted iterative non-linear process model was proposed for requirements analysis and risk assessment. To validate this process model, it was implemented through consensus methods such as Delphi and Brainstorming for requirements analysis and risk assessment of an intelligent decision support system suitable for performance evaluation. The calculation of means and standard deviations of successive rounds of Delphi showed that different stakeholders reached a consensus on the main functional and non-functional requirements of the intelligent decision support system. In addition, the risks of the new system were identified. اولیاء، محمدصالح. 1382. کزارش نهایی طرح پژوهشی طراحی سیستم ارزیابی پژوهشی وزارت علوم، تحقیقات و فناوری. معاونت پزوهشی وزارت علوم، تحقیقات و فناوری، دانشگاه یزد. اولیاء، محمد صالح، محمد امین، و مرتضی خاکزار. 1383. طراحی یک سیستم ارزیابی برای واحدهای پژوهشی. کنفرانس آموزش عالی و توسعه پایدار، تهران. صنیعی آباده، محمد، سینا محمودی، محدثه طاهرپرور. 1391. داده‌کاوی کاربردی. تهران:نیاز دانش. علیدوستی، سیروس. 1385. روش دلفی: مبانی، مراحل و نمونه‌هایی از کاربرد، فصلنامه مدیریت توسعه 31(زمستان): 9-23. مهدیان، حمید. هاجر عطاران، و زهره میراحمدی. 1391. ارزیابی عملکرد پژوهش و فناوری واحدهای پژوهشی کشور در سال 1391. وزارت علوم، تحقیقات و فناوری – معاونت پژوهش و فناوری. Alexander, Ian F, and Ljerka Beus-Dukic. 2009. Discovering requirements: how to specify products and services: John Wiley & Sons. Arango, Guillermo Francisco. 1988. Domain engineering for software reuse. Asnar, Yudistira, Paolo Giorgini, and John Mylopoulos. 2011. Goal-driven risk assessment in requirements engineering. Requirements Engineering 16 (2):101-116. Azadeh, A, SF Ghaderi, M Anvari, HR Izadbakhsh, M Jahangoshai Rezaee, and Z Raoofi. 2013. An integrated decision support system for performance assessment and optimization of decision-making units. The International Journal of Advanced Manufacturing Technology 66 (5-8):1031-1045. Boehm, Barry. 1989. Software risk management. European Software Engineering Conference. Bourque, Pierre, and Richard E Fairley. 2014. Guide to the software engineering body of knowledge (SWEBOK (R)): Version 3.0: IEEE Computer Society Press. Brown, Bernice B. 1968. Delphi process: A methodology used for the elicitation of opinions of experts. Rand Corp Santa Monica CA: Rand Corp Santa Monica CA. Cailliau, Antoine, and Axel Van Lamsweerde. 2012. A probabilistic framework for goal-oriented risk analysis. Requirements Engineering Conference (RE), 2012 20th IEEE International. Çelik, Başak, Sertan Girgin, and Kahraman Ünlü. 2010. A decision support system for assessing landfill performance. Waste management 30 (1):72-81. Chen, Charlie C, Chuck CH Law, and Samuel C Yang. 2009. Managing ERP implementation failure: a project management perspective. IEEE transactions on engineering management 56 (1):157-170. Cohen, Louis, Lawrence Manion, and Keith Morrison. 2013. The ethics of educational and social research. In Research methods in education, 99-128. Routledge. Cohon, Jared L. 2004. Multiobjective programming and planning. Vol. 140: Courier Corporation. Cooper, William W, Lawrence M Seiford, and Joe Zhu. 2004. Data envelopment analysis. In Handbook on data envelopment analysis, 1-39. Springer. Deniz, Dervis Z, and Ibrahim Ersan. 2001. Using an academic DSS for student, course and program assessment. Proceedings of the ICEE 2001 Conference. Deniz, Dervis Z, and Ibrahim Ersan. 2002. An academic decision support system based on academic performance evaluation for student and program assessment. International Journal of Engineering Education 18 (2):236-244. Dennis, Alan, Barbara Haley Wixom, and Roberta M Roth. 2008. Systems analysis and design: John wiley & sons. Giannoulis, Christos, and Alessio Ishizaka. 2010. A Web-based decision support system with ELECTRE III for a personalised ranking of British universities. Decision Support Systems 48 (3):488-497. Giorgini, Paolo, Stefano Rizzi, and Maddalena Garzetti. 2008. GRAnD: A goal-oriented approach to requirement analysis in data warehouses. Decision Support Systems 45 (1):4-21. Graessler, Iris, Philipp Scholle, and Jens Pottebaum. 2017. Integrated process and data model for applying scenario-technique in requirements engineering. Proceedings of the 21st International Conference on Engineering Design (ICED 17) Vol 3: Product, Services and Systems Design, Vancouver, Canada, 21-25.08. 2017. Greatorex, Jackie, and Trevor Dexter. 2000. An accessible analytical approach for investigating what happens between the rounds of a Delphi study. Journal of advanced nursing 32 (4):1016-1024. Hasson, Felicity, Sinead Keeney, and Hugh McKenna. 2000. Research guidelines for the Delphi survey technique. Journal of advanced nursing 32 (4):1008-1015. Heiko, A. 2012. Consensus measurement in Delphi studies: review and implications for future quality assurance. Technological forecasting and social change 79 (8):1525-1536. Jeffery, Keith, and Anne Asserson. 2009. Institutional repositories and current research information systems. New Review of Information Networking 14 (2):71-83. Kaklauskas, Arturas. 2015. Biometric and Intelligent Decision Making Support: Springer. Khoshroo, Mohammad Javad, and Omid Fatemi. 2010. SEMAT, National Current Research Information System for IRAN'. CRIS. Kotonya, Gerald, and Ian Sommerville. 1998. Requirements engineering: processes and techniques: Wiley Publishing. Laplante, Phillip A. 2007. What every engineer should know about software engineering: CRC Press. Lemke, Christiane, Marcin Budka, and Bogdan Gabrys. 2015. Metalearning: a survey of trends and technologies. Artificial intelligence review 44 (1):117-130. Lopes, Milene Elizabeth Rigolin Ferreira, and Carlos Henrique Quartucci Forster. 2013. Application of human error theories for the process improvement of Requirements Engineering. Information Sciences 250:142-161. Loucopoulos, Pericles, and Vassilios Karakostas. 1995. System requirements engineering: McGraw-Hill, Inc.
Lund, Mass Soldal, Bjørnar Solhaug, and Ketil Stølen. 2010. Model-driven risk analysis: the CORAS approach: Springer Science & Business Media. Macaulay, Linda. 1996. Requirements for requirements engineering techniques. Requirements Engineering, 1996., Proceedings of the Second International Conference on. Marimin, Marimin, Adhi Wibisono, and M Arif Darmawan. 2017. Decision support system for natural rubber supply chain management performance measurement: a sustainable balanced scorecard approach. International Journal of Supply Chain Management 6 (2):60-74. Martin, Sacha, Aybüke Aurum, Ross Jeffery, and Barbara Paech. 2002. Requirements engineering process models in practice. 7th Australian workshop on requirements engineering. Deakin University, Melbourne, Australia. McManus, John. 2012. Risk management in software development projects: Routledge. Merkert, Johannes, Marcus Mueller, and Marvin Hubl. 2015. A Survey of the Application of Machine Learning in Decision Support Systems. ECIS. Powell, Catherine. 2003. The Delphi technique: myths and realities. Journal of advanced nursing 41 (4):376-382. Power, Daniel J, Ramesh Sharda, and Frada Burstein. 2015. Decision support systems: Wiley Online Library. Pressman, Roger S. 2005. Software engineering: a practitioner's approach: Palgrave Macmillan. Ross, Douglas T, and Kenneth E Schoman. 1977. Structured analysis for requirements definition. IEEE transactions on Software Engineering (1):6-15. Rosson, Mary Beth, and John M Carroll. 2009. Scenario based design. Human‐computer interaction. boca raton, FL:145-162. Samoilenko, Sergey, and Kweku-Muata Osei-Bryson. 2013. Using Data Envelopment Analysis (DEA) for monitoring efficiency-based performance of productivity-driven organizations: Design and implementation of a decision support system. Omega 41 (1):131-142. Schön, Eva-Maria, Jörg Thomaschewski, and Maria Jose Escalona. 2017. Agile Requirements Engineering: A systematic literature review. Computer Standards & Interfaces 49:79-91. Tenso, Tanel, Alexander Horst Norta, Hannes Rootsi, Kuldar Taveter, and Irina Vorontsova. 2017. Enhancing requirements engineering in agile methodologies by agent-oriented goal models: Two empirical case studies. 2017 IEEE 25th International Requirements Engineering Conference Workshops (REW). Turban, Efraim, Ramesh Sharda, and Dursun Delen. 2011. Decision support and business intelligence systems: Pearson Education India. Vaishnavi, Vijay K, and William Kuechler. 2015. Design science research methods and patterns: innovating information and communication technology: Crc Press. Van Lamsweerde, Axel. 2008. Requirements engineering: from craft to discipline. Proceedings of the 16th ACM SIGSOFT International Symposium on Foundations of software engineering. Van Lamsweerde, Axel. 2009. Requirements engineering: From system goals to UML models to software. Vol. 10: Chichester, UK: John Wiley & Sons. Van Lamsweerde, Axel, Simon Brohez, Renaud De Landtsheer, and David Janssens. 2003. From system goals to intruder anti-goals: attack generation and resolution for security requirements engineering. Proc. of RHAS 3:49-56. Van Lamsweerde, Axel, and Emmanuel Letier. 2000. Handling obstacles in goal-oriented requirements engineering. IEEE Transactions on software engineering (10):978-1005. Vercellis, Carlo. 2011. Business intelligence: data mining and optimization for decision making: John Wiley & Sons. Wang, Wei-Kang. 2005. A knowledge-based decision support system for measuring the performance of government real estate investment. Expert Systems with Applications 29 (4):901-912. Wang, Wei-Kang, Hao-Chen Huang, and Mei-Chi Lai. 2008. Design of a knowledge-based performance evaluation system: A case of high-tech state-owned enterprises in an emerging economy. Expert Systems with Applications 34 (3):1795-1803. Wen, W, YH Chen, and IC Chen. 2008. A knowledge-based decision support system for measuring enterprise performance. Knowledge-Based Systems 21 (2):148-163. Wibowo, Santoso, and Hepu Deng. 2015. Multi-criteria group decision making for evaluating the performance of e-waste recycling programs under uncertainty. Waste Management 40:127-135. Williams, Patricia L, and Christine Webb. 1994. The Delphi technique: a methodological discussion. Journal of advanced nursing 19 (1):180-186. Yang, Yan, Wei Tan, Tianrui Li, and Da Ruan. 2012. Consensus clustering based on constrained self-organizing map and improved Cop-Kmeans ensemble in intelligent decision support systems. Knowledge-Based Systems 32:101-115. Zhang, Hao Lan. 2009. Application of multi-agent technology to information systems: An agent-based design architecture for decision support systems. Australasian Journal of Information Systems 15(2).